THIS REAL ESTATE MANAGEMENT AND LEASING AGREEMENT ("Agreement") made and effective as of the _____ day of ________, 20__ by and between COMMERCIAL PROPERTY LANDLORD, INC. a ____________ corporation ("Owner"), and AGREEABLE MANAGER, INC., a ____________ corporation ("Property Manager"). 1.1 Engagement. Owner hereby engages Property Manager as an independent contractor in the management, leasing and operation of the Premises and, subject to the limitations set forth herein, hereby authorizes Property Manager to exercise such powers with respect to the Premises as may be necessary for the performance of Property Manager's obligations hereunder, and Property Manager accepts such engagement on the terms and conditions hereinafter set forth. Property Manager shall have no right or authority, express or implied, to commit or otherwise obligate Owner in any manner whatsoever except to the extent specifically provided herein. (a) Contracts. To contract, for periods limited to Owner's possession of the Premises, but not in excess of one year without prior written approval of Owner, in the name and at the expense of Owner, for gas, electricity, water, and such other services as are necessary or convenient for the proper operation of the Premises. Service contracts shall be written to include a right of the Owner to terminate the agreement upon thirty (30) days notice without payment of a fee unless otherwise approved by Owner. A schedule of all service Contracts presently in effect with respect to the Premises is attached hereto as Exhibit "B" and by this reference made a part hereof. (b) Employees. To select, employ, pay, supervise, direct and discharge all employees necessary for the operation, management, maintenance and leasing of the Premises in accordance with the staffing plan attached hereto as Exhibit "C" and by this reference made a part hereof (the "Staffing Plan"), and at wages not in excess of those provided for in the Approved Budget or as otherwise approved by Owner in writing, and to use reasonable care in the selection and supervision of such employees. Owner shall have the right to approve the hiring, change, or removal of any such employee contemplated by the Staffing Plan from time to time. Likewise, Owner shall have the right to require Property Manager to remove from the Premises any employee employed by Property Manager in connection with the operation, management and leasing of the Building who is not satisfactory to Owner in the exercise of Owner's good faith judgment. Any change to the Staffing Plan must be approved by Owner in writing. All persons employed or utilized in connection with the operation, management, maintenance and leasing of the Premises shall be employees of Property Manager or of such contractors as may be retained by Property Manager pursuant to the Agreement, and not employees of Owner. Property Manager shall be responsible for complying with all laws and regulations and collective bargaining agreements, if any, affecting its employees, including without limitation laws and regulations governing worker's compensation insurance and compulsory non-occupational disability insurance. Property Manager is and will continue throughout the term of this Agreement to be an Equal Opportunity Employer. All costs associated with the operations of the Premises that have been included in the Approved Budget or that have otherwise been approved by Owner in writing shall be reimbursed to Property Manager or paid by Owner. In furtherance of the foregoing, the salaries, wages, benefits, payroll taxes and other direct personnel expenses incurred by Property Manager in connection with the employees retained by Property Manager in accordance with the Staffing Plan shall be paid by Property Manager in the percentages set forth on the Staffing Plan and shall be set forth in the Approved Budget. To the extent that the Staffing Plan reflects that an employee of Property Manager is dedicating less than 100% of its time toward the management or operation of the Premises, then Owner shall have the right from time to time at its discretion to audit the responsibilities of such employee for purposes of equitably reflecting the actual time allocated by such employee to the Premises. (c) Maintenance and Repairs; Building Improvements. To keep the Premises in a clean and sightly condition and to make (or cause to be made by contractors retained by Property Manager pursuant to contracts in the name of the Owner) all repairs, alterations, replacements, and installations, do all decorating and landscaping, and purchase all supplies necessary for the proper operation of the Premises or the fulfillment of Owner's obligations under any lease or other agreement of which Property Manager has notice, or compliance with all known governmental and insurance requirements. Property Manager shall not, however, make any non-budgeted purchase or do any non-budgeted work in excess of $2,500.00 for any single expenditure (or $25,000 for all such expenditures during any one year) without obtaining in each instance the prior approval of Owner, except in circumstances which Property Manager shall deem to constitute an emergency requiring immediate action for the protection of the Premises or of tenants or other persons or to avoid the suspension of necessary services. Property Manager shall promptly notify Owner immediately of the necessity for, the nature of, and the cost of, any such emergency repairs or compliance. Property Manager shall submit a list to Owner from time to time of contractors and subcontractors performing tenant work, repairs, alterations or services at the Premises under Property Manager's direction. Property Manager shall supervise, administer and coordinate the construction of all tenant improvements within the Premises ("Tenant Work") as a part of its duties, including the supervision of any reconstruction of the Premises or capital improvements. Notwithstanding the foregoing, Property Manager acknowledges that Owner may from time to time enter into separate agreements with third party consultants (including affiliates and/or subsidiaries of Property Manager) to manage and supervise construction of such Tenant Work and other improvements at the Premises. Property Manager shall assist Owner in facilitating the efforts of such third party consultants. Property Manager shall obtain the necessary receipts, releases, waivers, discharges and assurances to keep the Premises free from mechanics' and materialmen's liens and other claims. Owner shall receive the benefit of all discounts and rebates obtainable by Property Manager in its operation, management and maintenance of the Premises. Property Manager agrees to take advantage of such discounts and rebates wherever available and reasonable. If Property Manager desires to contract for repair, construction, or any other service described in this subparagraph with a party with respect to which any partner or shareholder of Property Manager holds a beneficial interest, such interest shall be disclosed to and the contract must be approved by Owner in writing before such services are procured. The cost of any such services shall be at competitive rates, notwithstanding that tenants of the Premises may be required to pay such costs. Property Manger shall not insist or require that any tenant use Property Manager or any party with respect to which any party or shareholder of Property Manager holds a beneficial interest to perform any Tenant Work. (d) Tenant Complaints and Requests. To handle promptly complaints and requests from tenants and notify Owner promptly of any material complaint made by a tenant. In addition, Property Manager shall, at the request of Owner, cooperate with, coordinate and/or administer tenant surveys at no additional cost to Owner. Property Manager shall communicate to the tenant and use its best efforts to enforce all rules relating to the Premises as they may be established by Owner from time to time. (e) General Liability Insurance Requirements. To notify the general liability insurance carrier for the Premises and Owner promptly of any personal injury or property damage occurring to or claimed by any tenant or third party on or with respect to the Premises and to promptly forward to the carrier, with copies to Owner, any legal document delivered to Property Manager relating to actual or alleged potential liability of Owner, Property Manager, or the Premises. In no event and under no circumstances, however, shall Property Manager be authorized or permitted to accept service of process on behalf of Owner with respect to any legal proceeding. Property Manager shall carry comprehensive general liability insurance with appropriate contractual and indemnification coverage and employer liability and worker's compensation in form, amount and from companies reasonably acceptable to Owner, shall include Owner as an additional insured under the liability policy with appropriate waivers of subrogation, and will deliver a copy of such liability policy or an original certificate of insurance to Owner. The cost of such liability insurance shall be at Property Manager's sole cost and expense. FICA, FUTA and worker's compensation, social security and unemployment insurance for personnel employed in connection with the operation and maintenance of the Premises at the position and levels of staffing set forth on the Staffing Plan shall be at the expense of Owner. (f) Tenant Indemnifications. 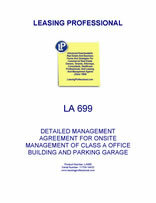 To advise Owner of pertinent covenants in leases in which the tenants agree to hold Owner harmless with respect to liability from any accidents and/or to replace broken glass, and to secure from such tenants and forward to Owner any certificates of insurance, and renewals thereof, required to be furnished by the terms of such leases. (g) Bank Accounts and Disbursements. At the option of Owner, to receive and collect rent and all other monies payable to Owner by all tenants and licensees in the Premises and to deposit the same promptly with _________ Bank of __________________, N.A. or such other bank as may be designated by Owner from time to time (the "Bank") in an interest bearing account approved by Owner and in the name of Owner (the "Bank Account'). The Bank Account shall be used exclusively for such rent and other monies and shall in no event be commingled with funds of Property Manager. Property Manager may disburse funds from said Bank Account solely in payment for, or to reimburse Property Manager for payment of, authorized expenses incurred in connection with the operation of the Premises in accordance with the then current Approved Budget approved by Owner pursuant to this Agreement. Property Manager shall obtain Owner's written approval of all checks for payments in excess of $10,000 (with the exception of utility payments) and for any payments to Property Manager. In the event state law requires that tenant security deposits be held in a separate account, such account shall be established by Property Manager in the name of Owner and may be non-interest bearing (to the extent permitted by applicable law). Owner's representative designated from time to time will be a signatory on all bank accounts maintained by Property Manager.